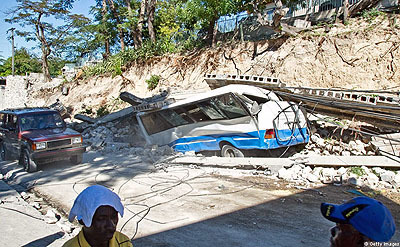 On January 12th, a 7.0 magnitude rocked the city of Port au Prince, toppling buildings, twisting metal and killing what are said to be scores of people in the impoverished country of nearly 10 milllion. Images are coming in and they are horrific as reports indicate. Relief efforts are underway with the first relief efforts coming from China. 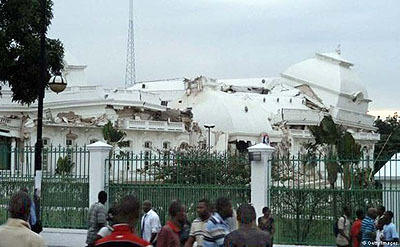 President René Préval has declared the event a catastrophe as most of the capitol city is destroyed. Haiti, a nation famous for being the first Black independent republic in 1804, has had a difficult political past. In these challenges, the nation has been able to survive on sheer will and determination. However, this latest disaster will take a special gargantuan effort. Can nation standing on the shoulders of a proud history rise from destitution and despair and reclaim its greatness? It can, but the nation will need an outpouring of assistance as never before. It is without a doubt that hearts around the world are pouring out for Haiti. On behalf of The Chess Drum community, chess players from around the world and in particular, those from the African Diaspora, we wish you courage and strength. We hope that you continue to hold your nation in high esteem and know that all is not lost. 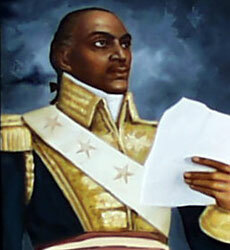 Your history and the example you led during Haitian Revolution will inspire us forever. You can inspire yet again! We are with you! 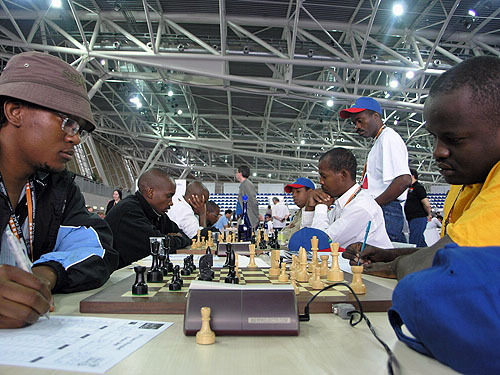 I met the Haitian team at the 2006 Chess Olympiad in Turin, Italy. They were a friendly group and enthusiastic about chess. I watched them analyze and got to speak a few words of French with them. They could not attend the 2008 Olympiad because of the hurricanes that swept through the area. If anyone know any of the chess players pictured below, please send me an e-mail or have them contact me at webmaster@thechessdrum.net. Please donate to any one of the Haitian relief funds! 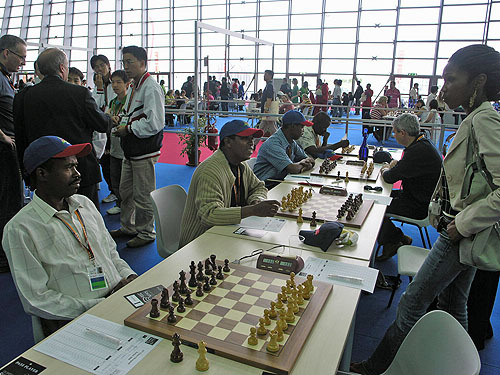 Haitians preparing to pawn off in round #1 of 2006 Olympiad in Turin, Italy. 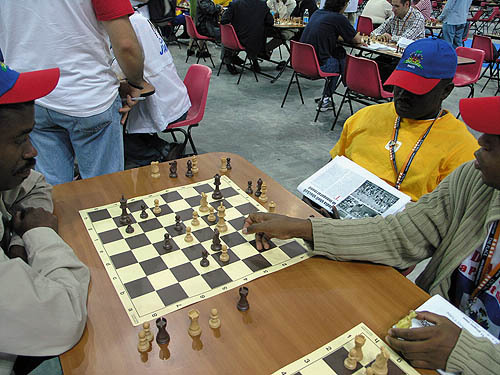 Haitians analyzing game during the 2006 Olympiad in Turin, Italy. If anyone know any of the chess players pictured above, please send me an e-mail or have them contact me at webmaster@thechessdrum.net. On this site you will see some beautiful pictures of all the children they have impacted through the game of chess. My prayers go out to my friend Sabine Bonnet, all of the others she works with who have dedicated themselves to teaching the game of chess to the young people in Haiti, and the children they have touched. 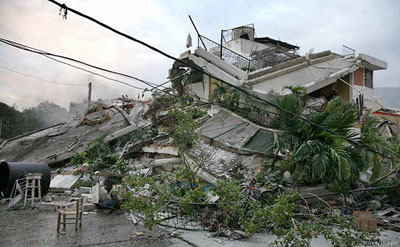 I pray that you are all okay and that after all of this you are able to rebuild to something even greater than before. My prayers are with you Sabine and I hope that I hear from you soon. While I’m hestitant to display more grief to the thousands of images and videos that have already been seen, I want to impress upon the readers here how important it is to make whatever contributions that you can. For those who are in the chess community, you may have seen some of the pictures at the link Adia has given above. Those were happy chess moments in a place that already had its share of economic problems. These problems have just increased 100-fold. Here are some of the images (Getty Images) that you may have seen in magazines or websites. 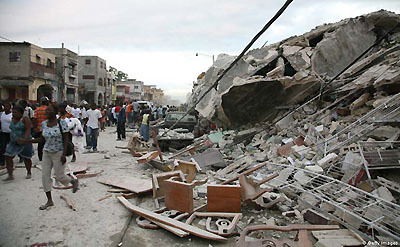 FIFA offers its wholehearted support to the people of Haiti at this painful time. Our thoughts are with the many victims, the injured and their families. Why are there not even words of comfort on the FIDE website? An entire nation has been lost… a nation who last sent a team to the Olympiad in 2006! Does Ilyumzhinov know that a major human disaster has occurred in a nation with an active chess community? Daaim are you in contact with any of the chess players in Haiti? If so, why not start a chess community contribution and give 100% to the chess players you are in contact with. The Liberty Bell Open starts today and I’ll post up a message by the cross tables and asked Bill and Brenda to post something on the registration tables. Whatever the amount we can raise for our brothers in chess will surly help. All monies I gather at the Liberty will be sent directly to you and you can distribute to Haitian chess players. If you have a poster that I can put at the tournament site please send it to me. Unfortunately, I don’t have direct contact with them at this point. However, I did send a test e-mail to the Chess Academy there. I hope someone can access e-mail from the cell phone. Everything is pretty much devastated. We probably can raise money in the future for a new club and equipment. Right now people need the basics. If I can get through to someone over there or a Haitian here, I’ll call you. I am a NM from Maryland and I believe it only takes one person to start up a movement to get others to help out. I have nothing in common with the Haitian people to be honest but I started up a donation drive at my company to donate to the Red Cross and its in full swing. I believe you guys are doing the right thing by exposing visibility of Haitian chessplayers to others around the world as I was curious about them myself. It is poor that FIDE has not a single mention of them on their website but even worse is the USCF not mentioning a single thing on their website! Instead we get self-serving articles about people making money off poker and lauding the same GM’s for the umpteenth time. You guys are making an impact and keep up the coverage! Even major chess websites like chessbase, chessvibes etc are not mentioning this. This should be the top news everywhere since chessplayers may be victims of this. I plan to launch a fundraiser here. We will do a separate fundraiser for that later. As you can see, they had a thriving chess community. I am trying to contact President Sabine Bonnet, the Board Members or players I met in Italy in 2006. I may have to rely on Haitians that are living here to make to contact. I hope to present the donation from the chess community to her or a designee. I certainly hope she has survived the carnage. I wouldn’t wish this catastrophe on anyone, but I believe there would be more attention in the chess media if it were a more prominent chess nation. What other reason could it be that we have not heard a statement from the FIDE President? Perhaps Kirsan Ilyumzhinov doesn’t know there are players in Haiti, but Rohan Waite of Barbados told me he brought up the hurricane issue at the General Assembly in Dresden and got no response. They were scheduled to come to that 2008 Olympiad in Dresden before being hit by 2-3 hurricanes. I’m not sure what Waite said to the body, but these types of tragedies must show some compassion for a member nation. 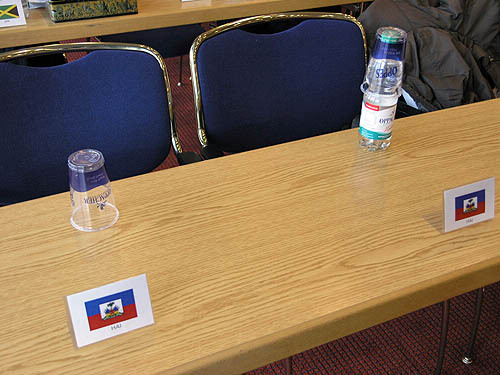 Haiti’s empty seat at FIDE Assembly at the 2008 Olympiad in Dresden, Germany. They missed the tournament due to a series of hurricanes that swept through the area. They are facing yet another catastrophe. Send prayers and contributions. Photo by Daaim Shabazz. Grandmasters will assemble to partake in the prestigious Corus tournament. During the opening ceremony there was good cheer, good food and anticipation of tomorrow’s beginning. Let’s hope there is some discussion on this crisis and what the chess world will do to help. It is my hope that the organizers of Corus at Wijk aan Zee will make a statement about the crisis. I remember Polgar, Topalov, Kasimjanov and Ponomariov donating their prizes to the Congo. This was a very kind gesture and these GMs will never be forgotten. Here is a nice music video by Arcade Fire titled “Haiti”. Images of happier times on the island. Together with a friend have sent something like 13 dollars. Don’t know how far that will go but I would have wasted that on beers anyway. On TV the situation seems to be getting worse by the hour. It seems much worse than it was 24hrs ago. FIFA is much bigger than FIDE (more financial muscle and international clout), if they can show some concern what’s wrong with FIDE? Whatsmore this thing is on just about every newspaper and station worldwide. Daim, your comment on the fiesta in Wijk An Zee explains the absurd ignorance of the world chess community. The Haitian devastation has left me speechless. My prayers go out to those who are alive and have lost family and friends. I urge them to remain strong so as to be able to pick up their lives from this point onwards. I am making a pledge today to donate towards the recovery effort and I urge all who feel concerned, chessplayer or not, to do same. Its a pity though about FIDE’s silence. I’m going to ask Nakamura when I get a chance if there was any type of announcement of support. I am hoping that people like Viswanathan Anand can make a plea as World Champion. He has the moral integrity and has a history of aiding these causes. I don’t have his contact information at this time, but I’m drafting a letter. I would like to share my deapest sadness on what happend in Haiti. I have never been so sad in my life. Having been in Haiti several times and making so many Haitian friends (chess players and IT professionals) Haiti has special place in my heart. To tell you the truth this unimaginable devastation has left me questioning God’s existance or fairness. 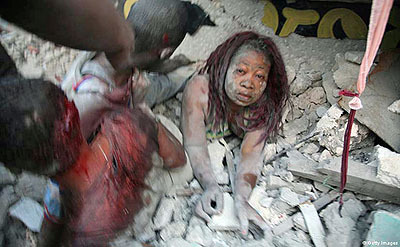 What have the poor, innocent, and proud people of Haiti have done to deserve this? I don’t understand it. I have donated as much money as I can (taking out loan which I will be paying for sometime to come). I have also volunteered to go down there through USSAID to lend helping a hand in the humanitarian and reconstruction effort. I hope to be abel to travel soon. I have sent email to several of my friends and so far I got only one response. I would like to believe that they don’t have the time or access to email to write me back but they are safe and alive. Thinking of the other possibility is unbearable to me. 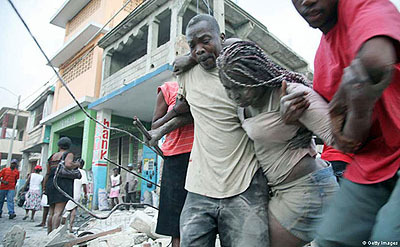 My thoughts are with the people of Haiti. It is truly a terrible time for our Haitian brothers/family. I feel as if a tremendous weight is on my shoulders as a result of the castastrophe that has befallen this once great nation. I have experienced feelings of sadness and horror which are indescribable. It seems as if the loss is ours here in Jamaica due to the reaction of the people here!! 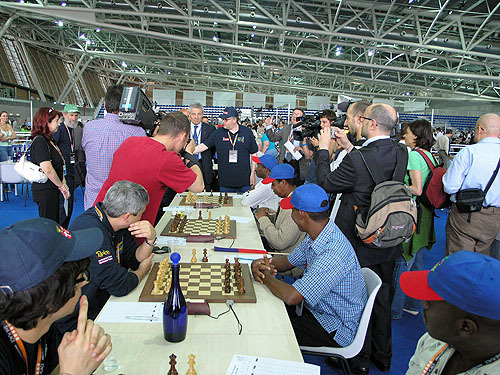 It is curious that only about two weeks before the earthquake, I sat and thought how we in Jamaican could establish some chess ties with our Haitian counterparts! Indeed, I remembered the glory days of sports in Haiti capped by the country’s participation in the 1974 World Cup in what was then West Germany. Let us reach out to our Haitian friend/families and brothers in whatever way we can – donations of cash and kind and, more importantly, prayers and spiritual support. Like many, I believe that out of every tragedy some good can result. Although the magnitude of this tragedy is great hopefully equally great good can come of it. It is time that Haiti truly starts the long-awaited recovery to lift the general populace from the awful standard of living they have faced for too long. The fact that the eyes of the world have been forced to stare at Haiti might, hopefully, enure to the benefit of a country that appears to be perennially ravaged by debts and civil wars. Hopefully, those responsible for bringing Haiti to Her current state will find some conscience to atone and help in the recovery. I will see if we can establish some links with the chess players/community there. You speak of the 1974 World Cup. As you may know, Haiti was the first Caribbean nation to qualify and that was a proud moment. Below are a couple of clips showing this proud moment. Though Haiti was ousted it gave confidence to the entire region. Of course Haitians are not new to World Cup success. You may remember that when the U.S. beat England 1-0 in 1950, it was Haitian Joe Gaetjens who scored the winning goal. He had immigrated to New York and played club soccer before he was discovered by the U.S. National Team. One of the unsung stars of the 1974 World Cup was Emmanuel Sanon and it is interesting that one of the players on the Haitian 2006 Olympiad squad has the same surname… Mondoly Sanon. There is a probably connection. Here is the Haitian glory of 1974. I am the President of the League Chess Guadeloupe. We are really unhappy drama is happening in Haiti. For the past two years we worked with Sabine and her Chess Academy HAICA dealing, which develop Chess in Haiti with young people whatever their origin. 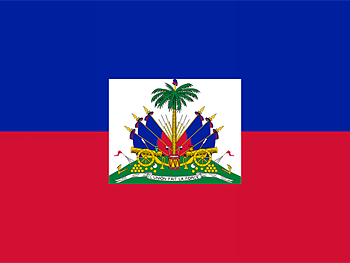 We support Haiti and the Haitian community in the chess great ordeal through which it passes. We will soon organize a tournament of support for Haiti and the Haitian community for chess raise funds. Glad to hear from you. The whole of the Caribbean sympathized given that most islands have had to deal with unfortunate natural disasters in the past. Sabine is a tireless worker and I’m familiar with her work through a mutual friend. Of course, poor nations in the African Diaspora (worldwide) are often overlooked, but my goal is to make sure that they receive attention. 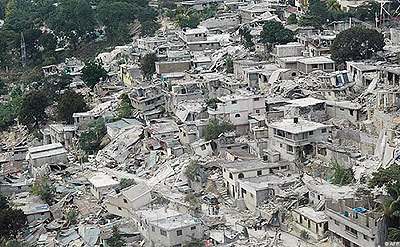 We all will help rebuild the work of Sabine when Haiti has stabilized. That will take some time. Meanwhile I hope to hear more from Francophone Caribbean chess communities such as those in Guadeloupe and Martinique. I met Martinican players in Trinidad and hope to meet some Guadeloupeans soon! Let’s work to help Haiti become whole once again! The list of Kirsan’s official supporters increases. Earlier this week Zimbabwe and Colombia joined the Chessfidelity list followed at the end of the week by Haiti. 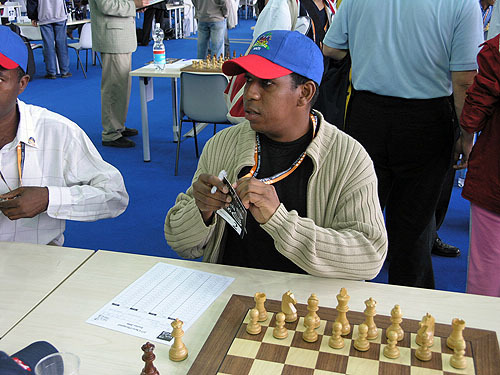 The letter of support from the Haiti Chess Federation was signed by the Delegate Mr. Jean Lamothe. Thus the Supporters List of Kirsan’s Presidential ticket amounts to 83 out of 155 voting countries! Just found a report that Jean Rene Bonnet, 38, is missing. His wife is Sabine Bonnet , President of HAICA (mentioned above). They have two children… Jeannissah, seven years and Sarjeah, five years. If you have any information of his whereabouts, please post here or go to http://www.ireport.com/docs/DOC-389497 and post your comments. I have heard from Sabine Bonnet! She tells me she is in Miami (zipcode 33161) and is requesting assistance. She says she has lost everything, but did not mention her husband… only her children. I’m screening this message to make sure it is her and not someone trying receive funds in her name. I’ll keep the chess community posted. I’ve done some cross-checking with Adia Onyango (who has contacted her) and I’m 90% sure the person who returned my e-mail was Sabine Bonnet. When I talked to Adia and told her I received an e-mail from Sabine, she gave me an account similar to mine (above). They will talk via phone on tomorrow and we will find out what she needs. Got another e-mail from Sabine. Her husband, Jean Rene Bonnet is OK and is with her and the children! This isn’t much, but it’s a poem to any and everyone effected by the recent earthquake in Haiti. I have no idea how far this will go, but I just needed to get it out there. God Bless! It’s mid day, and you’re just doing what you do. In the next few seconds the world is crashing down around you. but it take time for the realization to get through your head. You ask why it’s happening now. and you’re not sure you’ll make through some how. and you begin to survey your crumbling town. Getting over the dead, they trip and stumble. but you take imediate action, know you can still help somebody. So you dig throught the debris, pulling people out. But still, you hear screams and more shouts. Saving your people with heartfelt meaning. Understanding that this happened, but still wondering why? Why would this happen, to a counrty full of poverty and pain? Does the disaster just keep trickling down like the rain? a small part of our big world now covered in rubble. So to Haiti, your not lost, not forsaken. because as a part of our world, you’ve not been forgotten. Wonderful poem Shayne and thanks , ONE LOVE HAITI!!! Brother Shabazz we cannot expect reciprocity from fide, they kinda busy in the back room trying to study. I just spoke to Sabine Bonnet this morning. She is in need of assistance in Miami. I will be starting a fund for her family. For all that she did in the chess community, she deserves some assistance. Stay tuned. All goods for you and your efforts on remember those people that all help is necessary. I hope you remember me: My name is Pinto and i was at the African meeting representing Angola. Please can you give your email? and Africa chess union email ? Yes… I remember of course. My e-mail is webmaster@thechessdrum.net. You can contact Dabalani Buthali at dabilanib@bnpc.bw. You’d better start baking. Here’s the list of donors. Botswana vs. Haiti in round #2. Lebrun standing and watching Bazile’s game. Picture from front to back are the following matches: Ofentse Molale-Mondoly Sanon (#4), Tebogo Pitlagano-Jocelyn Bazile (#3), Ignatius Njobvu-Valery Afriany (#2), FM Phemelo Khetho-Persont Lebrun (#1). Photo by Daaim Shabazz. 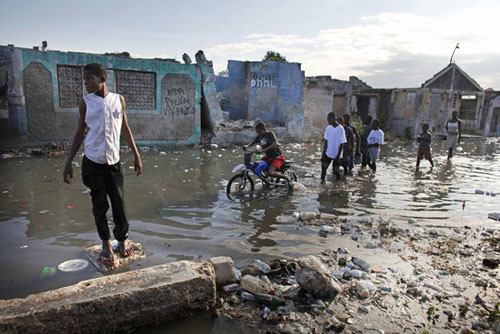 Torrential rains are now pelting Haiti turning and the earthquake survivors are now living in mud… literally. 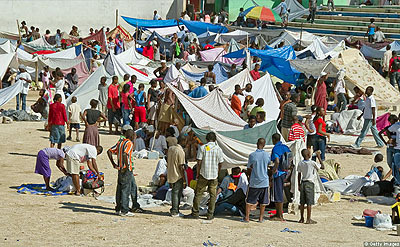 Haitians living in those tents don’t have adequate protection. Disease will fester in the dampness. Don’t forget about Haiti. Their challenges have only just begun and the rain season is upon us. Continue donating! Torrential rains have causing widespread flooding.